The Green Township Historical Association is proud to have had two members publish works about Green Township. 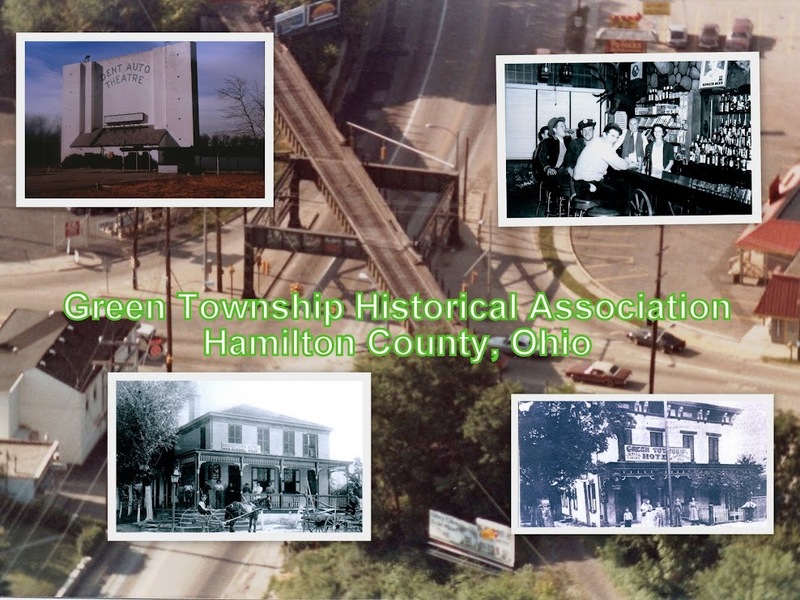 Please visit their publisher's websites and support these individuals efforts to preserve and spread the word about Green Township History. In addition, we have posted descriptions and links to two earlier works that have been digitized by the Public Library of Cincinnati and Hamilton County. Both of these sources provide invaluable information regarding everyday life in early Green Township History. In 1809, Cincinnati was officially a burgeoning Wild West town. It was called the “gateway to the west” by the people pouring onto the public landing from the myriad of steamboats docking by the river’s edge. Meanwhile, a densely forested, recently opened area just miles outside the city was being organized. A handful of rough and tumble frontiersman took a break from cutting their farms from the forest and answered the call from the constable to attend a meeting establishing a township. This township met the requirements of the Land Ordinance of 1785—a thirty-six square mile tract of land; the only one laid out this way in the Symmes Purchase. These men unknowingly were helping to set the stage for what would become one of the largest townships in Ohio. In 2009, two hundred years after its founding, Green Township has become known as the “Westside” by outsiders. To those who live there, it is called home. This book celebrates the history and heritage of Green Township and its journey from isolated frontier wilderness to being one of the largest townships in the state of Ohio. Numerous photographs, an appendix, a bibliography, and a full-name index add to the value of this work. 2011, 5½x8½, paper, index, 130 pp. To order a copy, please click HERE for the publisher's website. The Green Township communities of Bridgetown, Covedale, Dent, Mack, Monfort Heights, and White Oak had their humble beginnings in 1809. By the early 1900s, Green Township was primarily a rural farming community. The advent of the streetcar, and eventually the automobile, made traveling much easier. New and improved roads and better cars in the 1930s and 1940s enabled workers to commute to Cincinnati or the industrial Millcreek Valley. With this growth, the west side expanded greatly with the building of new homes, schools, and churches. By 1940, there were 18,500 Green Township residents. By 1960, the number had grown to more than 37,300. The 2000 census listed 55,660 residents, making Green Township the second-largest township in Ohio. 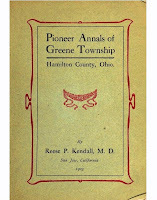 The following two books are historic books detailing facts about 19th Century Green Township. They have been digitized by the Public Library of Cincinnati and Hamilton County and are free to view on the libraries website. Each book has a description as well as a link to the libraries online digital library. Just click the link to view. Thanks to the Public Library of Cincinnati and Hamilton County for their efforts to digitize and preserve local history! 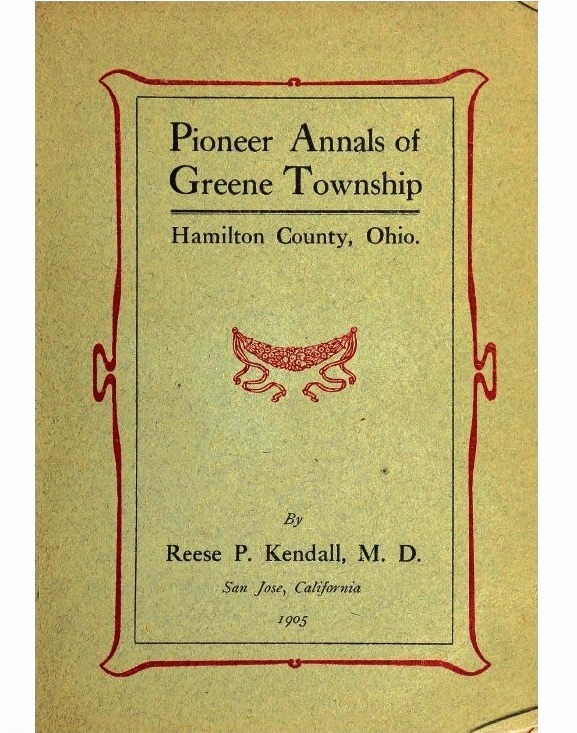 This book records the tradition, legend, and history of many early pioneers and settlers of Green Township in the 1800s. It is organized by the family name, listed alphabetically. Hundreds of Green Township families are mentioned along with where they migrated to Green Township from along with spouse and children’s names. In many cases, interesting facts and stories about the person or family are told. The second half of the book records longer narratives about some key Green Township residents. There is an alphabetical index of names on the final few pages. Charles Schaible was one of nine children of Michael and Louisa Schaible. The Schaibles lived on a mid-sized farm in Green Township along Muddy Creek Road and today’s Westbourne Avenue in the second half of the nineteenth century. He made notes about his life story and the story of his ancestors. His notes covered 960 hand-written pages. The first few chapters describe everyday life on a typical 19th-century farm. Charles writes about his family, the farm, what they grew, what they ate, their neighbors, his school days, games the kids played, the inside of the house (rooms, beds, lack of plumbing, etc.) – in other words, what it was like in Green Township in the 1800s. The remaining chapters describe the rest of this self-made man’s life to the 1930s. Charles was a founder of St. Martin’s Parish. He lived in Cheviot and helped organize the Cheviot Building and Loan Company. He also started his own company, the Schaible Foundry and Brass Works Company, which made valves and other plumbing supply items. 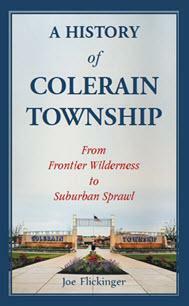 Our Vice-President, Joe Flickinger, has published his second book, this time covering our northern neighbor Colerain Township. His book uncovers exciting events from the Siege of Fort Dunlap by Native Americans, to the growth of their farming communities during the 1800's, and finally their growth as a suburban community during and after the baby boom after WWII. Support this book and others about local history. It's only through these books and the many hours of research that go into them that the history of our areas can be spread for all to read! Colerain Township, located in Hamilton County, Ohio, was established in 1794. Predating the establishment of the state of Ohio in 1803, John Dunlap, a native of Coleraine, Ireland, surveyed the area. The early history of the township includes a siege on Fort Dunlap by Native American warriors for over twenty-four hours. They gave up when they heard reinforcements were on their way from nearby Cincinnati’s Fort Washington. After the Treaty of Greenville, the area was cleared for mainly rural farming, with small villages dotting the landscape, which housed a post office, a tavern or two, and maybe a few stores or shops that supported the farmers. The area remained rural until the end of WWII when suburban sprawl rapidly changed the small two-lane roads into bustling thoroughfares and the cornfields into cul-de-sacs with two or three bedroom homes and a garage for the family car. Today, Colerain Township is home to over 60,000 residents, making it one of the largest townships in Ohio. However, those who live there call it home. This book celebrates the history, heritage, and story of Colerain Township, and its journey from the isolated frontier wilderness, to rural farming, to a modern suburban community, bursting with people and business. Numerous photographs, an appendix, a bibliography, and a full-name index add to the value of this work. 2018, 5½x8½, paper, 136 pp. This book celebrates the Bicentennial History and Heritage of the Hamilton County City of Cheviot, Ohio. Where did the city come from? Where did it get the name "Cheviot"? 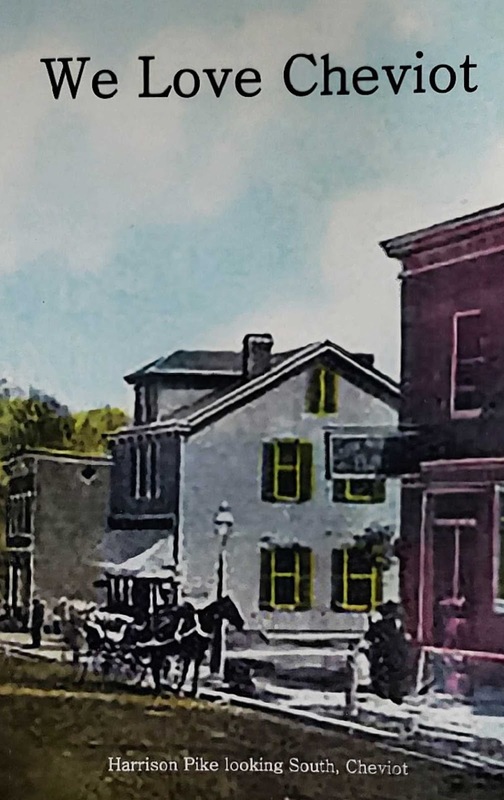 This book answers these questions and more about this small city in Hamilton County Ohio that celebrated its Bicentennial in 2018. Copies can be purchased from Cheviot City Hall, as well as our Treasurer and co-author Roberta Michel at our meetings. The book is $10, and all proceeds from the sale of the book go to the newly formed Cheviot Historical Society. Copyright 2011-2018 Green Township Historical Association, All rights reserved.. Awesome Inc. theme. Powered by Blogger.